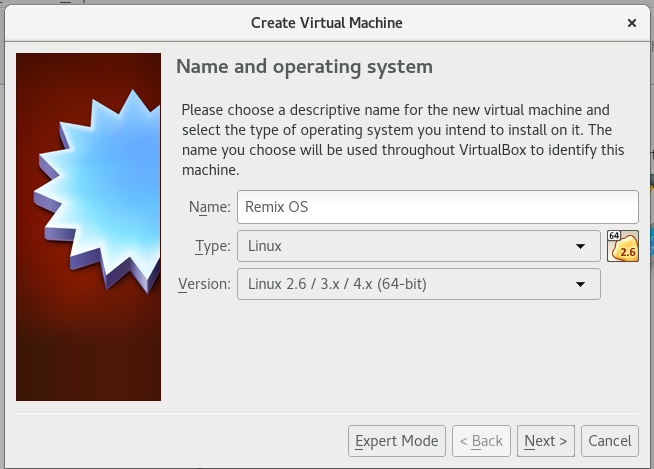 I have been trying to get the Remix OS 3.0 working on gnome boxes and VirtualBox for quite some time now. Almost all the guides, tutorials, etc. I found online either didn’t work or were too vague to be of any use. Having recently purchased the FlashRouters Linksys WRT 1200AC router, I wanted to utilize the combination of ExpressVPN android app and Hotstar to be able to stream cricket matches (since this setup was working on android but not on Fedora 25 running laptop). Anyhow, I’ll get to the point straight away. 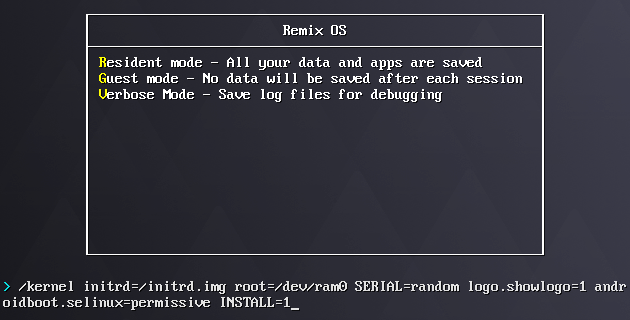 Following are the steps I followed to install Remix OS 3.0 in resident mode in VirtualBox and needless to say you need to have VirtualBox installed on your system. I was able to successfully install and run Remix OS 3.0 on VirtualBox version 5.1.14 running on Fedora 25. Additionally, I had the Remix OS 3.0 64-bit ISO downloaded (Follow this link to download the ISO file). You’ll also need the ISO of GParted ready to go (Follow this link to download the ISO file). Now that virtual machine is created, we are ready to do some minor tweaks before beginning to fire up the VM. Un-check Floppy in Boot Order. Select PS/2 Mouse under Pointing Device. Increase Processors to 2 CPU. Check “Enable PAE/NX” under Extended Features. Increase Video Memory to 64 MB. Check “Enable 3D Acceleration” under Acceleration. Under Storage -> Controller: IDE, click on Empty. Click on the small blue’ish CD icon next to Optical Drive and select “Choose Virtual Optical Disk File…”. A file selector window will pop up from which select the previously downloaded GParted ISO file. After doing so, the settings section should look something like the image below. That’s about altering the settings for virtual machine. Simply click on “OK” to save the changes. 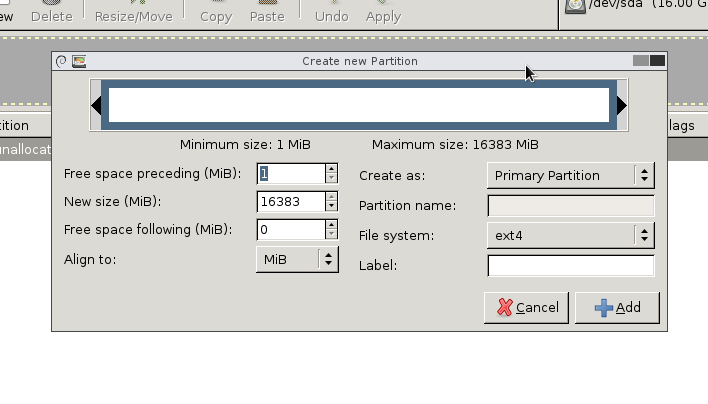 As of now what we have in virtual machine is raw disk without any partition format, size, etc. Using the GParted ISO Live CD we mounted in previous step, we’ll fix this and prepare the disk for installing Remix OS 3.0. 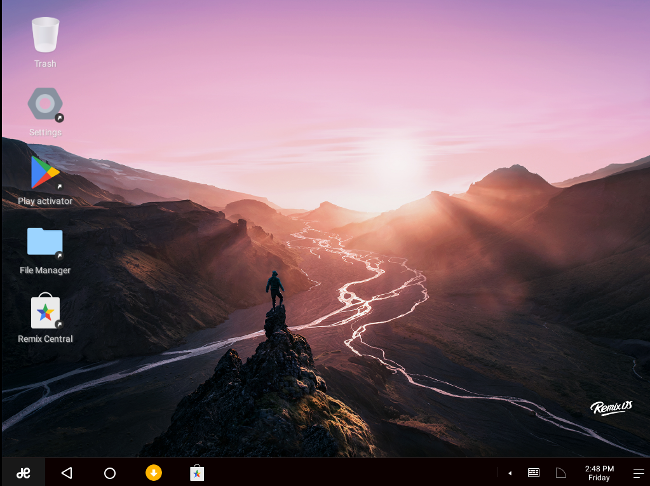 To do so, begin by selecting the newly created Remix OS virtual machine and clicking on “Start”. Assuming that everything was setup correctly, you’ll see the GParted ISO booting up and showing a menu with handful of options. Select the first one which says “GParted Live (Default Settings)” and press enter. We are now ready to prepare the disk for installing Remix OS 3.0. We’ll start by creating a partition table by clicking on Device -> Create Partition Table… and then clicking on “Apply” thereafter (ensure that msdos is selected). Now click on “New” icon (to the left of disabled “Delete” icon). In the newly opened dialog box, just click on “Add”. Lastly, confirm all these changes by clicking on “Apply” icon (simply confirm the proceeding confirmation dialog boxes). You can now close the GParted window (clicking on the last button at the top right corner of the window). And shutdown the virtual machine by double clicking on “Shutdown” icon located on desktop. Go back to settings for the virtual machine and under Storage -> Controller: IDE click on “Empty” and select the Remix ISO (as against GParted ISO we selected earlier). And click “Ok”. Start the virtual machine and highlight Resident mode. Press the Tab key on keyboard to edit boot parameters. Note that if in case you are not able to press tab in time, simply close the machine by clicking on File -> Close -> Power off the machine and start again. Ensure that sda1 is selected and click on “OK” (using keyboard, mouse will not work, use the arrow keys). Ensure that “Do not format” is selected and click on “OK” again. Select “Yes” to confirm installation of boot loader GRUB. Select “Yes” when asked to install /system directory as read-write. Wait for the installer to install Android-x86 (herein Remix OS). Once the installation is complete, select the “Reboot” option and click on “OK”. 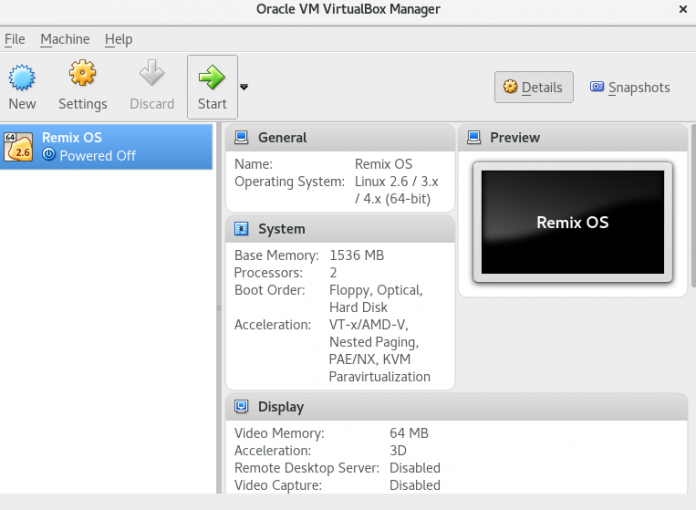 The virtual machine will not restart (as expected) but we are not interested in booting the Remix OS from the ISO now because it has already been installed and well, lets use that instead! So, let’s power off the machine by clicking on File -> Close -> Power off the machine. 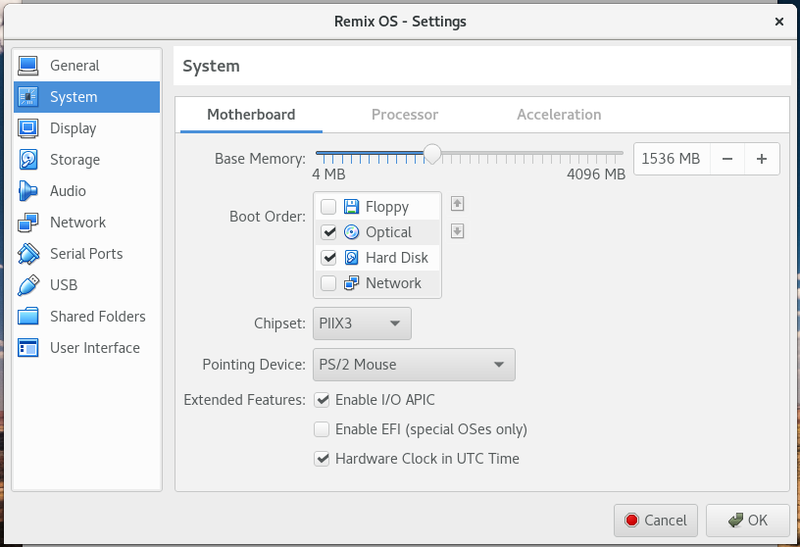 Now, we just need to get rid of the Remix OS 3.0 ISO by going back to virtual machine settings. Select Storage -> Controller: IDE and click on Remix_OS_… (the filename). Click on the blue’ish CD icon and select “Remove Disk from Virtual Drive”. Click on “OK” to confirm the changes. Disclaimer – Since Remix OS is constantly evolving, there is a possibility that this tutorial may not work for different version of Remix OS other than the one referred to here. Needless to say questions, comments are always welcome! Thanks brother with your help I have installed it. But while booting it’s stuck on remixos logo. Any advice on this problem? You’re the best ! .. Tks you very much ..